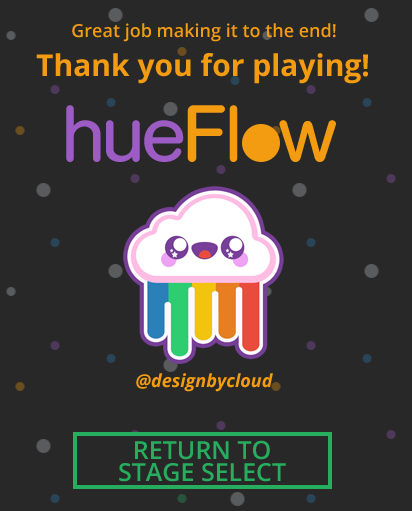 hueFlow is a game about timing and matching colors. Avoid the wrong colors and ensure your orb matches the next ring to continue! Mouse click or Spacebar to launch hueDot. I wanted to play through the winning game but just like Kwis, I become dizzy and somewhat frustrated by having to react in exactly the right moment. This game is of course beautifully made and it's not because of that. It is just not my cup of tea. Totally understand, it's def not a game for everyone. Thank you for playing and your feedback! TL:DR Great job, this is the only jam game that I played through to the end. The music is lovely. Why not play it on the "main menu" as well? Great use of simple aesthetics. With the orbiting you get a very planetary vibe and the circles in the background are stars without being stars. Very simple but well done. When you make an error, I like that it just punts you to the beginning of the level rather than having some big production or getting kicked to the menu or something. I wonder if you might slow it down a bit though so its a bit more obvious that youre going back to the beginning, at least initially. Nice difficulty progression. Starts off simple and then gradually ramps up with additional circles / speed variations etc. I didnt expect the white triangles to just bounce me back, unexpected but nice differentiation from just "losing"
HOLY CRAP i just flipped upside down and now im going the other way, unexpected stuff is fun. Now it turn again and im going up, and it zoomed out. Its funny how changing the direction throws you off. If I had to ding you on one thing, the theme is used in a very basic way. Summary: Production value very high, great feel, great controls, ease to understand, good progression of difficulty. This is one of the few jam games I've played that just feels well designed and not a rough mechanic. Didn't manage to finish it. At some point, it was making me feel dizzy cause you gotta anticipate with the right timing. It's not the game's fault though, as I'm not comfortable with that type of games. I just wish there was an "easy" option to get sent back to the last correct move, cause I couldn't bare it to the end. But I mean, that's my bad. The game on its own was good! Pretty superb level of polish, the right amount of satisfaction when doing the correct move (sound mostly, as visually there wasn't as much juice), and a gameplay simple yet addictive (I assume so at least, since it's naturally hard for me to get into that kind of games). Nicely done! This was so addicting, loved it! The nice, clean look combined with the soothing soundtrack provides an experience that's almost entrancing. The later levels were difficult, but I managed to reach the end. Easy to learn, hard to master! It's crystal clear that a lot of effort went into polishing the game, from rewarding correct timing to a non-punishing instant restart after making mistakes. And yeah, there totally needs to be a mobile port at some point. Thanks for playing, Peter. I'm glad you stuck through it and finished all 15 levels! I really enjoyed your stream! Wow, amazing game. I love the reflective obstacles that just bounce you back. I might be of a unique camp that I got a bit motion sick. Maybe it was the scrolling background? It just all made me feel unsettled so maybe looking into a reduced motion option would be a good idea in case you look to release this further! Also, that sound is gravy. So. Good. Very well done. Well made, well polished. The color scheme is very attractive (bold, primary colors would have gotten annoying to look at quickly). All the timing mechanics are intuitive yet challenging. It's a simple, addicting game. Thank you! Might be the best game I played during this game jam. Really well polished and addictive to play. An improvement point that comes to mind is that because they game resets so fast I sometimes do not know why I died. Maybe a small screen freeze or splash effect that shows that I am the wrong color in the circle would make the game feel even better. I can see this becoming a very addictive mobile game that makes people throw their phones against the wall. Really well done! Great game with really simple and well executed mechanics. I could easily see this game be a mobile hit. Everything is easy to understand but quite difficult to master which to me means a very well executed mechanic. Very well done, easily one of the best games I have seen from this jam. It was really polished game and I liked. It was really frustrating at the same time :D I have nothing bad to say, it was really well executed, and graphically pleasing minimalistic design, and sounds were done well too, background music was soothing. Awesome game! Frustrating as heck, but I can't stop retrying and retrying. I couldn't find any bug so far, and the minimalistic art style really fits the game perfectly. Levels are very innovative and something new is introduced regularly, which is great! Sometimes I just mashed the space bar at the beginning because I loved the "death"-sound so much. Really nice work with this one. For a jam game, this is incredibly polished. Extremely satisfying visuals, sound design, and concept come together very cleanly here. Not sure how many levels in I got, but I lost count. 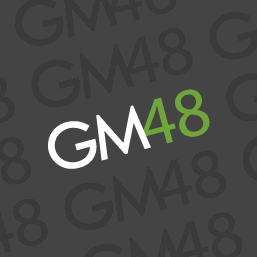 Highly addictive timing based game destined for a mobile port. Smooth gameplay. Quite tricky, but the instant restarts make it easily replayable. Great entry. Did spent way too much time on this XD Thank you Cloud, very cool! Im sad only because it's not at all forgiving :< reseting whole stage is too much imo. Does player travel at a constant speed, or he travels to each ring at the same time, no matter the distance? This game is beautiful and challenging. Just the way I like them. I'm really impressed with how much you got done in 48hours! Good Job! This is a very well made game. It's easy to get a hang of and still provides a serious challenge. The graphics and sound fit together perfectly. Really the only problem I have with it is that the difficulty ramps up very fast, but that's probably due to the small number of levels. Glad you enjoyed it, was fun to build! This is a game I wish I had 72 hours to complete instead of 48. I really think there is a lot of fun to this concept and as I dug deeper towards the end of the game I really started to see what kind of game this could be, but unfortunately didn't have the time. The first few hours I spent iterating over the concept and how I would apply it, once I realized "auto pilot" was the way to go I had some hurdles to overcome in creating new ways to challenge the player. On a personal level I think this game only scratches the surface in what it could be and even though it lacks the polish I wanted to give it I am very satisfied with this for something created in less than 2 days. Use timing to match your orb color to the rings!